Brisbane Central Business District is the third largest city in Australia. Brisbane CBD is the most populous city of Queensland and is the capital of Queensland. The Brisbane CBD is partially elevated by Mount Coot-tha. The Brisbane central business district lies in the curve of the Brisbane River with many parks, cafes and activities situated along the banks of the winding river. The Brisbane CBD streets are named after female members of the Royal Family (Adelaide, Alice, Ann, Charlotte, Elizabeth, Margaret, Mary) and run parallel to Queen Street and the Queen Street Mall. 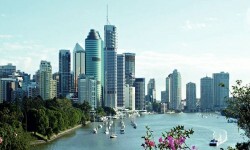 Brisbane CBD has a humid subtropical climate with hot, humid summers and dry, mild winters. Brisbane CBD is a fast growing urban centre yet has a laid back and easy going lifestyle. The Brisbane central business district is the hub for all public transport services including the Queen Street Bus Station, Roma Street Station and Central railway stations, and various city ferries including Brisbane's CityCat high speed ferry service. As the gateway into Brisbane and one of the main gateways into South-East Queensland, Brisbane Airport is a busy international and domestic airport. Brisbane City is the capital of Queensland and is a fast growing urban city. Visiting Brisbane is a pleasure, with a range of things to see and do, festivals throughout the year, outdoor events, sports games and more. If arriving on a late night flight to Brisbane Airport, or departing on an early morning flight from Brisbane Airport, Brisbane Airport accommodation is perfect. There is a variety of accommodation options around the airport in the surrounding suburbs of Aspley, Hendra, Nudgee, Chermside, Clayfield, Hamilton, Ascot, Eagle Junction, Northgate and Doomben. Redcliffe and North Brisbane is a very popular area for Brisbane residents during holiday season or weekend getaways, seeking a place to relax at sandy beaches and popular cafés. Redcliffe is a beautiful seaside city with less than 60 000 people. The Redcliffe peninsula is nestled on the edge of beautiful Moreton Bay. Redcliffe is just 35 minutes north of Brisbane, Queensland’s capital city. Redcliffe's average temperatures range from 15 to 24 degrees Celsius. Redcliffe contains the suburbs of Redcliffe, Clontarf, Scarborough, Woody Point, Rothwell, Kippa-Ring and Margate. Redcliffe is set amid Moreton, Bramble and Deception Bays. Redcliffe’s tourism opportunities are closely linked to the sea. 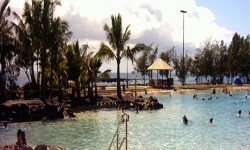 Redcliffe’s numerous leisure activities can be enjoyed on the Redcliffe peninsula, making Redcliffe one of south-east Queensland’s most scenic recreational playgrounds. North Stradbroke Island has some of the most spectacular scenery found in Queensland and some of the best vantage points for viewing the whales as they head north for the winter months. North Stradbroke Island, one of the world's largest sand islands, is situated at the southern end of Moreton Bay. White sandy beaches stretch for as far as the eye can see, while a system of freshwater lakes in the island's centre provides great picnic and swimming spots. From June to November each year, watch the majestic humpback whales pass the North Gorge Headland on their annual migration from Antarctica to their calving grounds near the Great Barrier Reef. While the calves are still quite young, they begin their southern return journey passing close to the coast. Dolphins, turtles and manta rays also frequent the waters off Point Lookout. You don't need to take a tour to do whale watching. You can take your own car or public transport and watch the whales from North Stradbroke Island. The rocky outcrops at Point Lookout are ideal vantage points for land-based whale watching. The whales pass close to the island, so it is usually possible to see them without the aid of binoculars. You can dine at one of the local restaurants or cafes, or take a picnic lunch and eat overlooking the ocean. One of the advantages of this, is that families with small children, elderly people or those with disabilities, are able to spend a day whale watching from a convenient and safe spot. Those wishing for a different viewpoint can take the North Gorge walk. Starting at the Captain Cook memorial, there is a signed track all the way around. If you would prefer to go on a guided tour, the 4WD tours take you on a tour of North Stradbroke Island, and include land-based whale watching. 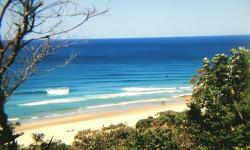 North Stradbroke Island has three main townships - Point Lookout, Amity Point and Dunwich. Brisbane South is the region south of Brisbane City on the way to the Gold Coast, QLD, Australia. Getting to Brisbane South is easy, with major arterial roads running through and providing easy access to Brisbane CBD, Brisbane Airport and the Gold Coast. Brisbane South is popular for its easy access to Gold Coast themeparks, sporting venues, the Wivenhoe Dam, Queensland Raceway and it's beautiful scenery. The Brisbane South region comprises the areas of Beenleigh, Yatala, Ipswich, Hillcrest, Browns Plains, Robertson, Eight Mile Plains and more. Check out our Brisbane accommodation including Brisbane hotel accommodation, Brisbane resort accommodation, Brisbane apartment accommodation. Affordable Brisbane accommodation to 4 and 5 star Brisbane resort accommodation. Select the accommodation in Brisbane that suits your needs and budget. 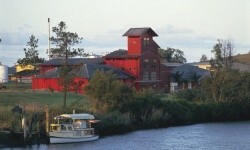 We also have Brisbane bed and breakfast accommodation. And discount Brisbane accommodation. Simply call our Call Centre to revieve the best prices available for your time of stay. Book your Brisbane accommodation now to avoid dissapointment!